Daniel Mountjoy was interviewed by a CNBC news crew for a story about "on-farm recharge," an innovative strategy that diverts water from overflowing rivers onto fallow farmland, where it seeps into the soil and replenishes depleted aquifers. This vineyard was flooded to allow the water to seep into the ground. If the sight of this winter's torrential rains left you pining for a way to capture the precious overflows, you are not alone. UC Santa Cruz alum Daniel Mountjoy is working to do just that—on a scale that has the potential to ease the state's increasingly persistent cycles of deluge and drought. The idea is to divert water from overflowing rivers onto fallow farmland, where it seeps into the soil and replenishes depleted aquifers. These "underground reservoirs" function like savings accounts, storing a valued resource for lean times. "The goal is balance. We want to redirect surplus water, fill underground basins, and have that water available to farmers during drought years," says Mountjoy (BA, environmental studies, 1985), director of resource stewardship at Sustainable Conservation, a San Francisco-based nonprofit focused on solving resource management problems. Mountjoy sees his role as facilitating a unique coalition—including farmers, environmentalists, academics, and water managers—that is developing and testing the strategy, called "on-farm recharge." The strategy is in its infancy, but models show it has the capacity to capture enough river water between November and March to offset 20 percent of the annual "overdraft" pumped out of critical areas of the San Joaquin Valley. "Farmers are interested," says Mountjoy. "We’re getting calls virtually every day. Environmentalists are interested, too, embracing the effort to restore the quality and quantity of groundwater and improve wildlife habitat. And state and regional water managers welcome it as a way to meet replenishment goals that are part of the 2014 Sustainable Groundwater Management Act. 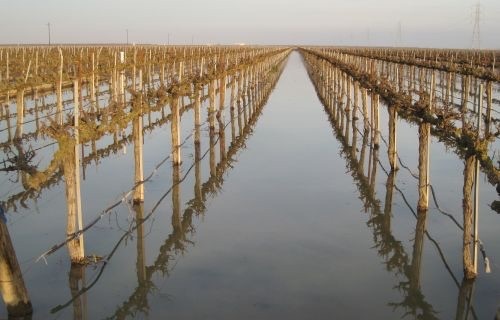 Sustainable Conservation is working with irrigation districts and 20 farmers of grapes, almonds, walnuts, and pistachios, and the group is aware of many others who are experimenting on their own. "This winter's heavy rains shifted it from a hypothetical to a very timely strategy," adds Mountjoy. Andrew Fisher, professor of Earth and planetary sciences at UC Santa Cruz, is a leading expert on groundwater and aquifers. Familiar with Sustainable Conservation's work, Fisher says on-farm recharge should definitely be part of the toolkit used to address California's water needs. "They are on the right side of history," says Fisher. The first farmer to deliberately flood his acreage was Don Cameron, manager of Terranova Ranch in Fresno County. It was during a 2011 winter storm, and he was afraid his levee was going to fail, so he flooded his land to relieve the pressure on the rain-saturated earthen berms. That got him wondering about the impact it would have on his crops—and when he detected no downside, he started thinking about the viability of recharging the aquifer. "Don was able to recharge 3,000 acre feet—enough water for up to 6,000 California households—without harming his crops," says Mountjoy. "The concept is valid, so now we're looking at the potential to scale up." Today, Mountjoy is partnering with Cameron and the Almond Board of California, UC Davis, Lawrence Berkeley National Laboratory, and several irrigation districts. Traditional academic research takes place over many years, but farmers and water managers are eager to move quickly, says Mountjoy, who sees himself as a bridge between researchers and growers. "This is how I like to work, from the ground up as opposed to the top down," he says. "Those who steward the land often know the issues and the problems, and have ideas about what to do, so it's about bringing them into dialogue with researchers, regulators, and economists to validate and refine the solutions." California's water woes aren't going away. Climate change models predict less snow—which historically provided the bulk of the state's water supply—and more rain. But our capacity to capture heavy rain and snowmelt is limited: Rainfall like this winter's fills reservoirs and man-made lakes, quickly exceeding our storage capacity. Yet the likelihood of building new dams and reservoirs is low: they are expensive, politically fraught, and environmentally controversial. By contrast, "nature's storage" is an affordable, practical way to store more water—and it boasts three-times the capacity of all the developed reservoirs in California. Farmers have coped with years of reduced surface-water allocations by pumping groundwater, sometimes until wells run dry. The water table has dropped ten to 100 feet in parts of the southern Central Valley over the past decade. The alarming pace of aquifer depletion led to the state's first-ever regulations on groundwater; they require communities to develop plans by 2020 to bring water supply and demand into balance. Even recharge won't be enough to quench the state's thirst. "Estimates are that we'll have a winter rain surplus maybe one out of every four years, so on-farm recharge has to be accompanied by conservation," says Mountjoy. "The new groundwater agencies will ultimately have to restrict how much farmers can pump." "Our goal is to raise awareness and share information," he adds. "We're trying to leverage whoever we can as partners." Recharge is practical and economical, but it isn't free. Cost estimates are $50-100/acre foot, compared to $1,00-2,500/acre foot for new dam construction. Mountjoy's staff and their partners are busy assessing the suitability of property and the state's water-moving infrastructure; factors include access to irrigation canals and gates, soil quality, and the location of underground basins. Economists are assessing what incentives farmers would need to participate, and how to share the benefits with others, while another nonprofit has stepped up to make all the geospatial data about rainfall and stream flows and site suitability accessible. Mountjoy notes that recharge has flood-control and habitat restoration benefits, too. "Before we built the levies, there was water all across the valley," he says. "We want to open up the canals and reconnect the rivers to the flood plains, and do it in a managed way. How can we learn from nature to do things for humans that mimic or build on nature, rather than fighting nature? This is an example of how you can do it. And it's cheaper." It's a complicated picture with multiple players, plenty of variables, and lots of possibility, which is just what Mountjoy likes about his work. "UC Santa Cruz taught me to be a systems thinker," he says, explaining that his broad education covered the science of agronomy and agroecology, as well as the social science of human behavior, the economics of cost, policy, and negotiation, and more. "When I wrote my undergraduate thesis, my adviser Steve Gliessman said, 'This is exactly what we wanted. As professors, we're all steeped in one discipline, but we wanted to present interdisciplinary courses—we knew you could figure out how to integrate it!' "
In addition to the statewide recharge project, Mountjoy is engaged in stream restoration and water conservation efforts on the Central Coast, including a project with resource conservation districts that provides real-time water-use data to strawberry growers. "No one organization or individual can make all this happen," says Mountjoy. "It's getting exciting, because everyone is at the table. We have depleted about half of the groundwater that's accessible to us, so there's no time to waste."